Dr. Terry Papneja presents a model combination of professional excellence (in his chosen profession as a dentist), entrepreneurial success and philanthropic zeal. After graduating in Dentistry from Indore, India, Terry Papneja moved to Canada in 1981. 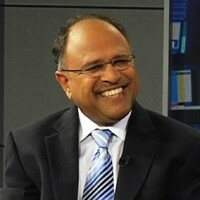 He acquired his degree in Dentistry from University of Toronto and opened his first dental office in Brampton in 1986. Starting initially as a lone dentist, he applied his business and professional skills to grow the business steadily to the point today, where the office boasts of eight dentists and 50 staff members. He started his second dental office in 1990 in Mississauga, which was also a success and eventually sold to one of his associates. Selling his second office afforded Dr. Papneja money and time, which he immediately applied to charitable causes and has been doing so since then. His initial donation of $60,000 helped to start a school for under-privileged children in small town of Kareli in Madhya Pradesh, a province in Central India and he continues to support the school financially. Today the school has over 1000 children on its roll and over 90 per cent of its children passed with first division in their 12th grade examinations. Dr. Papneja has also regularly organized Oral Cancer Surgery Camps in India for people in abject poverty, who would otherwise not have received the necessary oral care and medicines. Dr. Papneja’s biggest contribution for the cause of charity, however, is the starting of the Canadian Chapter of AIM for SEVA, an organization founded by Swami Dayananda, which works towards educating poor children. In the last eight years, the Canadian chapter of AIM for SEVA has raised over $ 2 million. Operating with zero-administrative cost, it has ensured that all the money raised goes directly to the charitable cause. Dr. Papneja has been honoured as “Humanitarian of the Year” by the Indo-Canada Chamber of Commerce. He also served as a board member with Hindu Maha Sabha Temple in Brampton.